German Talmudist; died in Stryj, Galicia, May 25, 1832. He was a great-grandson of Ẓebi Ashkenazi and a pupil of Meshullam Eger. Jacob was ab bet din in Kalisz and afterward in Lissa, and is usually quoted as Jacob of Lissa or Jacob Lisser. Later he returned to Kalisz and lived there for ten years. Jacob wrote: "Ta'alumot Ḥokmah," commentary on Ecclesiastes (Lemberg, 1804; Dyhernfurth, 1819); "Ẓeror ha-Mor" and "Palge Mayim," commentaries on Canticles and Lamentations, under the general title "Imre Yosher" (ib. 1815 and 1819); the character of all three is homiletic-haggadic. Jacob had intended to write commentaries on the Five Megillot also under this title. Jacob's importance, however, rests upon the following halakic writings, all of which contain ḥiddushim and bi'urim: (1) "Sefer Ḥawwot Da'at," commentary on Shulḥan 'Aruk, Yoreh De'ah, 69-201; the earlier sections of Yoreh De'ah (1-68) are very briefly dealt with in the form of an introduction to the work (Lemberg, 1799; Dyhernfurth, 1810, and often since in editions of the Yoreh De'ah, as the Wilna  ed.). In it the works of earlier commentators are discussed and somewhat pilpulistically developed. (2) "Sefer Meḳor Ḥayyim," commentary on Shulḥan 'Aruk, Oraḥ Ḥayyim, 429 and following, with notes on the commentaries "Ṭure Zahab" and "Magen Abraham"; the second part contains ḥiddushim on Keritot (Zolkiev, 1807; Frankfort-on-the-Oder, 1813; Warsaw, 1825; Dyhernfurth, 1827). (3) "Sefer Netibot ha-Mishpaṭ," commentary on Shulḥan 'Aruk, Ḥoshen Mishpaṭ, in two parts (Dyhernfurth, Lemberg; Zolkiev, 1809, 1816; Sudilkov, 1830; and often since in Lemberg editions of Shulḥan 'Aruk, Ḥoshen Mishpaṭ). (4) "Sefer Torat Giṭṭin," commentary on Shulḥan 'Aruk, Eben ha-'Ezer," 119-155, and ḥiddushim on the Talmudic treatise Giṭṭin (Frankfort-on-the-Oder, 1813; Warsaw, 1815). (5) "Sefer Bet Ya'aḳob," commentary on Shulḥan 'Aruk, Eben ha-'Ezer, 66-118, and on the Talmudic treatise Ketubot (Grubeschow, 1823). (6) "Sefer Ḳehillat Ya'aḳob," a collection of discussions and notes on several legal points in the Eben ha-'Ezer and Oraḥ Ḥayyim (Lemberg, 1831). Toward the end of his life Jacob composed a short compendium of dinim, under the title "Derek haḤayyim" (Zolkiev, 1828; Altona, 1831). This compendium is very popular and was frequently reprinted in the larger Hebrew prayer-books. These dinim are taken either from later exponents of the Law as contained in the works "Ṭure Zahab," "Magen Abraham," "Peri Megadim," etc., or from his own decisions. The sources from which he borrowed are usually indicated. Jacob wrote also a commentary on the Pesaḥ Haggadah under the title "Ma'aseh Nissim," with the text and a short compendium of the Passover ritual ("Kiẓẓur Dinim"; Zolkiev, 1807, 1835; Minsk, 1816; Dyhernfurth, 1817, and later). 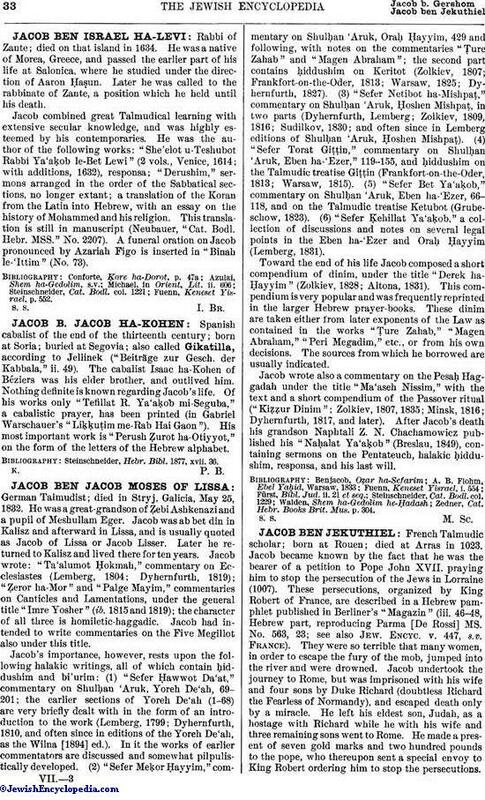 After Jacob's death his grandson Naphtali Z. N. Chachamowicz published his "Naḥalat Ya'aḳob" (Breslau, 1849), containing sermons on the Pentateuch, halakic ḥiddushim, responsa, and his last will. Zedner, Cat. Hebr. Books Brit. Mus. p. 304.